Ramblin’ Jack Elliott is returning to the Martin Hotel for a Great Basin Arts and Entertainment produced concert at 7:00 PM, Tuesday, January 25. Jack played the Martin just one year ago, on his way to Hollywood to pick up his Grammy Award. This year he is returning, on his way to the National Cowboy Poetry Gathering in Elko, but he is bringing along two of the best sidemen in the business so he can perform some of the songs from his Grammy Award winning record. Van Dyke Parks will accompany Jack on the piano, and David Piltch will play standup bass as Ramblin’ Jack performs some of the classic blues tunes that formed the theme for his latest recording. 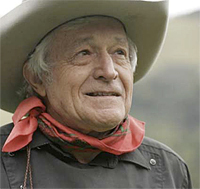 One of the last true links to the great folk traditions of this country, with over 40 albums under his belt, Ramblin’ Jack Elliott is considered one of the country’s legendary foundations of folk music. – Johnny Cash, The Johnny Cash Television Show, 1969. Long before every kid in America wanted to play guitar — before Elvis, Dylan, the Beatles or Led Zeppelin — Ramblin’ Jack had picked it up and was passing it along. From Johnny Cash to Tom Waits, Beck to Bonnie Raitt, Ry Cooder to Bruce Springsteen, the Grateful Dead to The Rolling Stones, they all pay homage to Ramblin’ Jack Elliott. In the tradition of roving troubadours Jack has carried the seeds and pollens of story and song for decades from one place to another, from one generation to the next. They are timeless songs that outlast whatever current musical fashion strikes today’s fancy. When he returned to America in 1961, he met another young folksinger, Bob Dylan at Woody Guthrie’s bedside, and mentored Bob. Jack has continued as an inspiration for every roots-inspired performer since. He has recorded forty albums; wrote one of the first trucking songs, Cup of Coffee, recorded by Johnny Cash; championed the works of new singer-songwriters, from Bob Dylan and Kris Kristofferson to Tim Hardin; became a founding member of Bob Dylan’s Rolling Thunder Revue; and continued the life of the traveling troubadour influencing Jerry Jeff Walker, Guy Clark, Tom Russell The Grateful Dead and countless others. In 1995, Ramblin’ Jack received his first of five Grammy nominations and the Grammy Award for Best Traditional Folk Album, for South Coast (Red House Records). Jack was again recognized with a Grammy Award for best Traditional Blues Album in 2009, for A Stranger Here (Anti-Epitaph Records). In 2000, Jack’s daughter, filmmaker, Aiyana Elliott produced and directed The Ballad of Ramblin’ Jack, her take on Jack’s life and their fragile relationship, winning a Special Jury Prize from the Sundance Film Festival. Ramblin’ Jack’s life of travels, performances and recordings is a testament to the America of lore, a giant land of struggle, hard luck and sometimes even of good fortune. Ramblin’ Jack takes us to places that spur us on to the romance and passion of life in the tunes and voices of real people. At seventy-nine, Ramblin’ Jack is still on the road, still seeking those people, places, songs and stories that are hand-crafted, wreaking of wood and canvas, cowhide and forged metal. You’ll find him in the sleek lines of a long haul semi-truck, in the rigging of an old sailing ship, in the smell of a fine leather saddle. BETTER YET, FIND HIM AT THE MARTIN HOTEL IN WINNEMUCCA ON JANUARY 25.